Steady As You Go© Falls Prevention exercise classes improve your balance, leg strength, flexibility, general fitness and wellbeing. 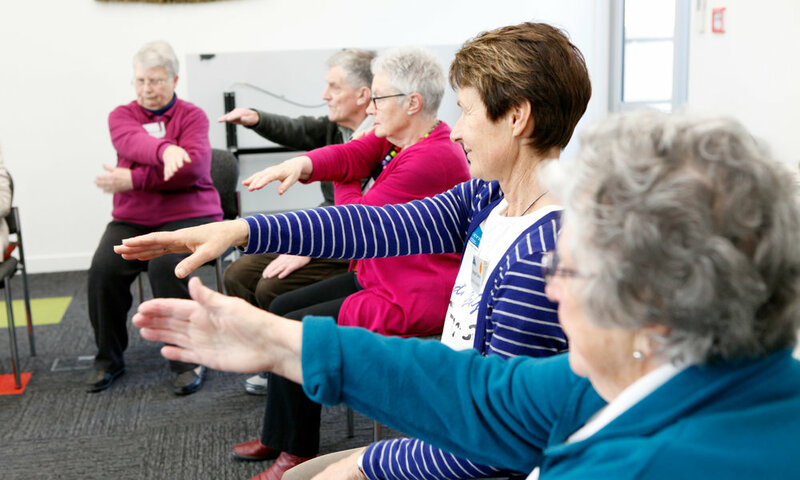 Steady As You Go© (SAYGo) is Age Concern Otago's peer-led exercise initiative designed to help older people / kaumātua reduce their likelihood of having a fall. The exercises are similar to those learned from a physiotherapist. Include simple exercises, seated in a chair, standing and walking. Proven to improve balance, spatial awareness, flexibility and leg strength. Participants feel physically better and more able. Class members enjoy being with a friendly group of like minded people. A range on light ankle weights are used for leg strengthening exercises. All participants are encouraged to work at their own pace. Classes are for one hour once per week. The SAYGO programme is so popular, Dunedin now has 48 neighbourhood classes in 27 suburbs; with 16 in Rural Otago townships. The programme is also now delivered in many places in New Zealand. The physical and social efficacy of this programme have been evaluated by the University of Otago. The exercises used are based on the Otago Exercise Programme and additional exercises from the University of Otago, School of Physiotherapy, Train the Trainer course. Steady As You Go© ( SAYGo) by Age Concern Otago is licensed under a Creative Commons Attribution-NonCommercial-NoDerivatives 4.0 International License.